Opposition leader Muhammadu Buhari has swept to victory in the Nigerian general election, inflicting the first defeat of an incumbent government in the history of Africa’s biggest democracy. With 35 of Nigeria’s 36 states declaring results, Buhari had polled 14,951,378 votes to sitting president Goodluck Jonathan’s 12,827, 522 – a lead of more than 2m votes. Jonathan called Buhari to concede, a spokesman for Buhari’s All Progressives Congress (APC) told Reuters. The outcome, following a highly competitive, expensive and at times vicious campaign, was hailed by analysts as a milestone for the advance of democracy on the continent. It marks the first time in Nigeria’s history that an opposition party has democratically taken control of the country from the ruling party. The APC spokesman praised Jonathan for conceding. “There had always been this fear that he might not want to concede but he will remain a hero for this move. The tension will go down dramatically,” said Lai Mohammed. Buhari, 72, first tasted power a generation ago as a military dictator, only to be ousted after 20 months and jailed. The former army general has campaigned as a born-again democrat intent on cleaning up the corrupt politics of the continent’s largest economy and most populous nation. It was his fourth run at the presidency since 1999. His chances were boosted by frustration over endemic corruption, criticism over Jonathan’s handling of Boko Haram’s six-year uprising and a well-organised opposition. Tensions mounted as both voting and the collation of results had to be extended by a day each. The second day of vote-counting got off to a dramatic start when a member of the governing party disrupted proceedings to accuse the electoral chief of bias. The logistics of transporting results from around the country to the national nerve centre Abuja slowed the counting process. Prof Akin Oyebode, an academic, noted that Nigeria lacks high-speed trains while flights are often delayed. “We have to remember we are a third-world country, not a first-world country,” he said. At a news conference Oct. 7, Ethiopian Prime Minister Hailemariam Desalegn announced that his country welcomes the participation of Egypt and Sudan in the construction of the dam and stressed that his government considers the dam to be jointly owned by Sudan, Ethiopia and Egypt. The following article was posted on Ethiopian government owned “Walta Information Center” website and removed later. Addis Ababa, 22 October 2013 (WIC) – Cairo and Addis Ababa may soon reach a truce to calm their dispute over the construction of the Renaissance Dam on the Blue Nile in Ethiopia. Both countries have recently shown good faith and agreed to negotiate about the project. Egypt has even agreed to take part in building the dam, though without declaring its conditions for doing so. At a news conference Oct. 7, Ethiopian Prime Minister Hailemariam Desalegn announced that his country welcomes the participation of Egypt and Sudan in the construction of the dam and stressed that his government considers the dam to be jointly owned by Sudan, Ethiopia and Egypt. Cairo viewed his statement as a positive step toward reaching a consensus on the project, despite its earlier sharp criticism of it. Egypt gets 55.5 billion cubic meters of Nile water annually in accordance with the 1959 agreement signed between Egypt and Sudan. About 85% of that share comes from the Ethiopian plateau, in particular from the Blue Nile tributary, on which Ethiopia intends to build the Renaissance Dam to store 63 billion cubic meters of water in and generate 6,000 megawatts of electricity. The Ethiopian, Sudanese and Egyptian water ministers are expected to meet Oct. 20-23 in Khartoum to discuss the May report of the Tripartite Commission on the repercussions of the dam and how to implement the report’s recommendations for avoiding harm to any of the Nile states. On Oct. 8, Egyptian Prime Minister Hazem el-Biblawi met with the Supreme Committee for the Nile Water to agree on negotiating mechanisms for dealing with Ethiopia. The gathering ended with approval for Egypt taking part in the dam’s construction. The final report of the Tripartite Commission contained several technical remarks regarding how the dam might harm Egypt. Some experts therefore have reservations about the Egyptian government’s sudden decision to participate in the project, especially if it is without considering the full consequences of such a decision. Al-Monitor obtained a copy of the report prepared by the Egyptian government on the Tripartite Commission’s final report. The Egyptian document states that building and operating the Renaissance Dam according to the current specifications is not in the interest of downstream countries — Egypt and Sudan — and will enable Ethiopia to fully control the flow of the Blue Nile. Moreover, the time required to initially fill the dam reservoir, three years, will negatively affect Egypt. The report pointed out that the study of existing designs showed a defect in the safety features concerning the secondary Saddle Dam. This, in turn, has the potential to affect the safety of the High Dam in Egypt. Most studies submitted by Ethiopia are preliminary and not meant for implementation purposes. In addition, no environmental and social impact assessments on downstream countries have been conducted. On the other side of the equation, the Ethiopian government announced in September that it had completed 30% of the engineering and technical preparations at the dam site and is ready to start building the main body of the dam. Sudan expressed its satisfaction with the project and asserted that the dam would protect Sudan from the floods it faces every year. Egypt is still trying to make the best of the situation and to secure its share of annual water from the Nile as it awaits the negotiations with Ethiopia and Sudan. Egypt fears that its demands will not be met at a time when the country is experiencing internal unrest, ongoing since the July ouster of President Mohammed Morsi and affecting Egypt’s relations with neighboring African countries. 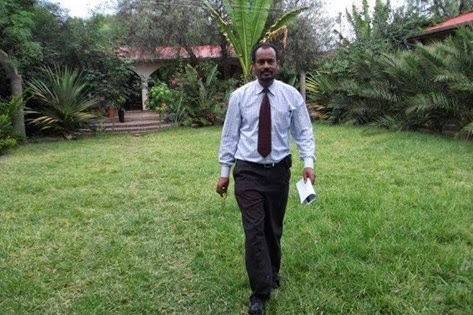 *በድንገት የህወሓት ፖሊሶች ወደ አቶ በቀለ መጡና “መጣራት ያለበት ጉዳይ ስላለ ወደ ቃሊቲ እስር ቤት ይወሰዳሉ” አሉ:: ቤተሰብም አቶ በቀለም ቀልባቸው ተገፈፈ:: ደስታቸው ብን ብሎ ጠፋ! ህወሃት – የመርዝ ገበሬ፤ ጥይት ማጭዱ!! “የትግራይ ተወላጆች ታጥቀናል ሲለኝ – ደነገጥኩ” የሚል አስተያየት የሰጠው ኳስ አፍቃሪ ከጎልጉል የአዲስ አበባ ወኪል ጋር የተገናኘው አዲስ አበባ ስታዲየም ነበር። ጉዳዩ ለሚዲያ ግብዓት እንደሚውል ባይረዳም ገጠመኙን ለመናገር የተገደደው ስለ ምርጫ አንስተው ሲወያዩ ነው። ድንገት ተገናኝተው ቆሎ በመገባበዝ የጀመሩት ጨዋታ ዘጋቢውን ወደ 1997 ምርጫ ትዝታ ወረወረው። ተግባብተው አወጉና ተለያዩ። የትግራይ ተወላጆች ታጥቀናል!! ለምን? መርዝ ዘርቶ በጥይት ለማጨድ? በ1997 ቅድመ ምርጫ የመጨረሻ ሰላማዊ ሰልፍ ወቅት የቅንጅት ሱናሚ አዲስ አበባን የዋጣት ዕለት፣ ሱናሚው አዲስ አበባን አጥለቅልቆ ኢህአዴግን በተለይም ህወሃትን ጣር ውስጥ በከተተበት ወቅት ምንም ነገር ማድረግ ይቻል ነበር። ቤተ መንግስት ገብቶ ሁሉንም የጨዋታ ህጎች መደፍጠጥ ይቻል ነበር። የጎጥም ይሁን የጎሳ ችግር የበቀል አራራ ቢኖር ኖሮ ከዚያን ጊዜ በላይ አመቺ ወቅት አልነበረም። ባድሜ ስትወረር የተመመው የኢትዮጵያ ህዝብ፣ ደጀን የነበረው የኢትዮጵያ ህዝብ ጉዳዩ የትግራይና የተወላጆቿ ነው ብሎ አልተቀመጠም። ፈንጂ ላይ እየሮጠ፣ ፈንጂ ላይ “እናት አገር ወይም ሞት” በማለት እየደነሰ ያለቀው ይህ ትውልድ በእውነት ቂመኛ ነው? የዘጋቢው ጥያቄ ነው!! ኢህአዴግ ዙሪያ ያሉ ድቃይ ድርጅቶችም በዚህ ጉዳይ ላይ በወጉ ሊመክሩና ከወዲሁ የሚበጀውን መንገድ በመከተል ቂምና ምሱን ለማክሰም መንቀሳቀስ እንደሚገባቸው ብዙዎች ይመክራሉ። ለህሊና ዋጋ በመስጠት የመርዝ እርሻን ማክሰም የጊዜው የከረመ ጥያቄ ነውና ሁሉም ልብ ሊሉት እንደሚገባ በተደጋጋሚ መዘገቡም አይዘነጋም። መርዝ እየዘሩ በጥይት አጭዶ ለመከመር መደራጀት ሌላውን ከሚያስፈራው ይልቅ የበደሉንና የቂሙን ቁስል ይበልጥ የሚያመረቅዝ ይሆናልና ህወሃት ልብ ሊገዛ እንደሚገባ የሚመክሩ ጥቂት አይደሉም። ህወሃት “ንፋስ ዘርቶ አውሎ ነፋስ አላጭድም” ማለት አይችልም – ቀን ጎዶሎ ነውና!! ለማፍቀር መፈቀር ፣ ሰው ለመርዳት ሰው መሆን ግድ ይላል ! ይህ ተፈጥሯዊ ህግ ሆኖ በሁላችንም ላይ ባይሰረጽም የታደሉት ሲሆኑትና ሲታደርጉት ከማየት አልፎ የድካማቸው ፍሬ አፍርቶ ሲያዩት ምስክር እማኝ መሆን መታደል ነው ። መልካም መስራት ለራስ ነው እንዲሉ ውስጥን ከሚሰጠው እርካታ ባሻገር የታደሉት የዘሩት አሽቶ መልካም ስራቸው በስኬት ጎዳና ሲታይና በውጤት ስኬቱ ሲደምቁ ማየት ከምንም በላይ ያስደስታል ። በአንጻሩ መልካም ሰርተው እጃቸው ” አመድ አፋሽ ” የሆኑንም አለማችን ከማስተናገድ አልቦዘነችም ። የአማድ አፋሽነቱ ህመም ጥልቆ ቢያመም የሰሩት ለውስጥ እርካታ ነውና ሁሉምም የሚያየው አንድ ፈጣሪ ፍርድ ይሰጣልና ህመሙ ህመም አይባልም ። አድርጎ “አመድ አፋሽ ” መሆን ክሽፈት ነው ከተባለ ምድራዊ ጊዜያዊ ክሽፈትነት ፈቀቅ አይልም ፣ የመልካምነት ሰማያዊ ጸጋቸው ሰፊ ነውና እኒህም የታደሉ ናቸው !